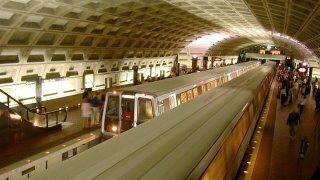 The Woodley Park Metro station will be closed this weekend due to escalator work, Metro officials say. Red Line trains will travel through the station, but won't stop there. Free shuttle buses will run between Woodley Park and Cleveland Park, Metro said. In addition, Red Line trains will be single-tracking between Silver Spring and Glenmont over the weekend. Red Line trains will run between Shady Grove and Silver Spring every 12-15 minutes, with additional trains between 9 a.m. and 9 p.m. Shuttle trains will run between Silver Spring and Glenmont every 20 minutes. Riders should transfer at Silver Spring to continue their trips. Also, on Saturday night, trains will single-track between Medical Center and Grosvenor from 8 p.m. to closing. All trains will board on the Shady Grove side of the platform. Service changes will also be in place on the Orange Line, where buses will replace trains between Vienna and West Falls Church on Saturday and Sunday. Trains will run at regular weekend intervals between West Falls Church and New Carrollton.